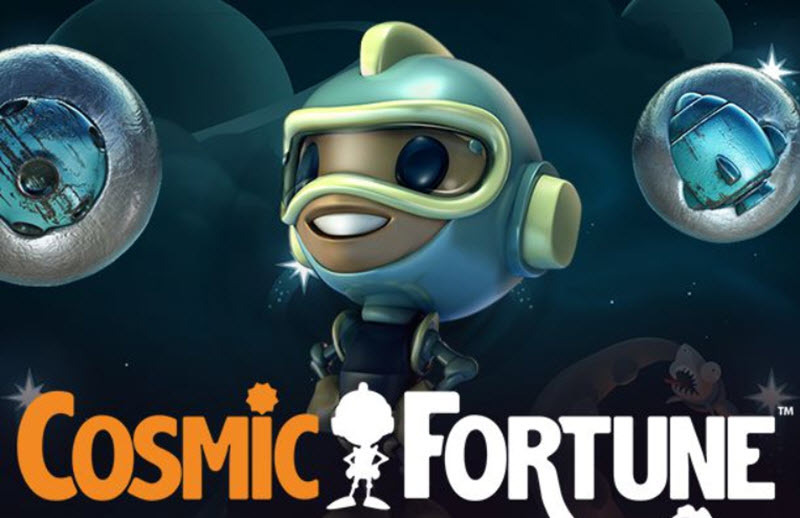 Cosmic Fortune is a space-themed NetEnt slot where the free spins round can pave the way to a bonus game where you have a chance of winning one of FIVE different jackpots; two fixed ones and three progressive ones. The value of the progressive Cosmic Fortune jackpots varies between casinos, so savy gamblers with multiple casino accounts can play in whichever casino that has the largest jackpot up for grabs at the time. When anyone makes a wager on Cosmic Fortune, a total 5.7% of the wager goes to feed the three progressive Cosmic Fortune jackpots in that casino. 3.3% goes to the Cosmic Fortune Mega Jackpot, 1.4% to the Major Jackpot and 1.0% to the Midi Jackpot. Cosmic Forunte is set in outer space, and you task is to fight the attacking aliens. Most of the symbols are either space ships or space creatures. To get you in the right mode, the gaming session starts with a short intro where a city gets attacked by flying saucers. This intro is very retro and reminds us of the early computer games of the 1980s. The actual slot game is not retro; it looks just like a mid-2010’s NetEnt slot with 3D effects. On Cosmic Fortune, you always play with all 15 paylines active. You can adjust the coin value and how many coins to bet per payline (from 1 to 10 coins). The larger your bet, the larger your statistical chance of winning one of the progressive jackpots. The wild symbol is adorned with a golden W.
The wild symbol can only appear on the second, third and fourth reel, never on the first or fifth one. The wild symbol can substitute for any regular symbol, but not for the scatter symbol (the blue S). Cosmic Fortune doesn’t have spinning reels. Instead, the symbols come tumbling down from above like an avalanche and form five columns. If you have played the famous Gonzo’s Quest slot, you will recognize the basic mechanics in Cosmic Fortune. When a winning combination is formed, those symbols will disappear, and the empty space they leave behind give room for new symbols to fall down. That way, you can win multipel times on a single wager. This feature is active both in the basic game and during the free spins round. The scatter symbol in Cosmic Fortune is the letter S in blue. You need to get at least three scatters simultaneously, anywhere on the reels, to start free spins mode. 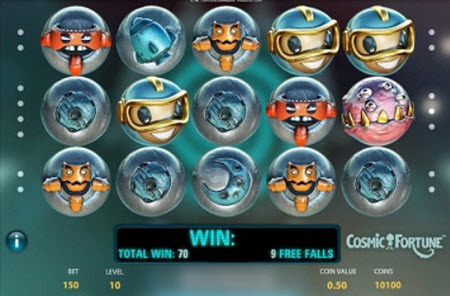 When a winning combination is formed during free spins, the included symbols turn into balls. These balls are your key to the bonus game that can follow after the free spins. Without balls, you won’t get to play the bonus game (see below). During the bonus game, the balls will come falling down. There are 4 Coin Win Cups and 5 Jackpot Collector Cups (3 for progressive jackpots and 2 for fixed jackpots). Balls falling to the Coin Win Cup yields coin wins, while balls falling into a Jackpot Collector Cup can bring you one of the jackpots. You need three balls in a Jackpot Collector Cup to win the corresponding jackpot. It is not possible to win more than one of the progressive jackpots during a bound game round.